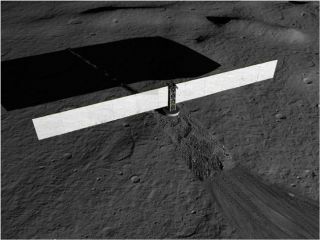 A concept of a nuclear reactor buried below the lunar surface to make use of lunar soil as additional radiation shielding. The engines that convert heat energy to electricity are in the tower above the reactor, and radiators extend out from the tower to radiate into space any leftover heat energy. The power system would transmit 40 kilowatts of electric power, enough for about eight houses on Earth, to the lunar outpost. NASA shouldresurrect a mothballed institute specifically geared to encourage visionaryconcepts for future space exploration, according to a new report from theNational Research Council (NRC). The report,released Friday, recommended that the space agency revive the NASA Institutefor Advanced Concepts (NIAC), which was shuttered in 2007, or replace it with asimilar innovation-focused entity in order to ?seek out far-reaching, advancedconcepts with the potential of significant benefit? to NASA?s charter andfuture missions. ?Today, NASA?s investment in advanced concepts and long-termtechnological solutions to its strategic goals is minimal,? the new reportstates. It found the NIAC program extremely successful in encouraginginnovative research. The102-page report comes on the heels of President Barack Obama?s Aug. 1 speechcalling on America to ?recapture the spiritof innovation? during his weekly radio address. In July, an older NRCreport also urged NASA to renew efforts in advanced technology development byestablishing an internal division modeled on the Pentagon?s Defense AdvancedResearch Projects Agency (DARPA). ?NASA hasreceived the report from the NRC and is in the process of assessing itscontents,? NASA spokesperson J.D. Herrington told SPACE.com in ane-mail. ?No decisions have been made based on its recommendations.? Between 1998 and 2007, NIAC served as a virtual institute toinvestigate advanced concepts by soliciting study proposals via the Internet andawarding grants for innovative research that could impact NASA?s missions overthe next 10 to 40 years. NASA shut it down to free up funding for its Visionfor Space Exploration, which is aimed at retiring the space shuttle fleet in2010, fielding its capsule-based replacement Orion in 2015 and returning astronautsto the moon by 2020. NIAC was established by the Columbia, Md.-based Universities Space ResearchAssociation (USRA) and received about $4 million a year in funding, more than75 percent of which went directly to grant awards, according to the report,which is titled ?Fostering Visions for the Future: A Review of the NASAInstitute for Advanced Concepts.? Grants typically ranged between $50,000 and$400,000, according to past reports. Some research projects were popular in the public and media,broadening NASA and NIAC?s exposure to the American people, the report stated. ?The majority of the NIAC-supported efforts were highlyinnovative,? the report states. ?Many pushed the limits of applied physics.Overall, the efforts supported produced results commensurate with the risksinvolved.? Past NIAC studies have included research into skin-tightspacesuits and a fleet of robots that could fly to an asteroid to deflect itfrom colliding with Earth. In mid-2006, grants were awarded to study thefeasibility of launching a giant shield into space to counteract global warmingand an evaluation of self-deployed habitats for space and planetaryexploration. In its original incarnation, NIAC?s focus on long-terminnovations over the next four decades may have hindered its ability to tieinto NASA?s shorter-term goals. The new report recommends that any new form ofNIAC use a study?s potential to yield a direct, major contribution to a futureNASA mission as a key selection benchmark. The reportalso urges NASA to broaden the field for NIAC-like grant applicants to allowthe space agency?s own scientists and personnel to participate, as well as toidentify which agency centers could serve as so-called technology champions tosupport promising studies. Accordingto the report, a new NIAC entity should report directly to the office of NASAAdministrator Charles Bolden, and be managed separately from other agencymission divisions. Initial grants for the new program could fund studies with up to$100,000 for a year in a Phase 1 approach, while a Phase 2 level could setaside up to $500,000 over two years for innovative research. The NRCreport stemmed from a half-year study by 12 experts in advanced space andaeronautical concepts. Robert Braun, director of the Space Systems Laboratoryat Georgia Tech, and Diane Wiley, a technical fellow at Boeing?s Phantom Works,led the committee, which was concerned by NASA?s lack of a specific avenue topursue advanced concept research. ?The termination of NIAC reflects a larger issue within NASArelated to the demise of advanced concepts and technology development programsthroughout the agency,? the report states. ?To effectively infuse advancedconcepts into its future systems, NASA needs to become an organization thatvalues and nurtures the creation and maturation of advanced aeronautics andspace concepts. ?